NOS BOMB by Muscle Rage is everything we wanted in a pump product that we knew would deliver phenomenal pumps every workout. 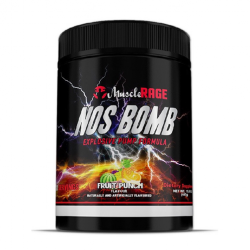 NOS BOMB like all of our products is not hidden in a proprietary blend, instead you can see that we spared no expense and only used the very best ingredients at the optimum dosage. This includes using the most effective patented ingredients not the slightly similar, less effective and less money versions of the ingredients. For too long there have been too many under dosed pump formulas. Or at the correct dosage but the wrong ingredients (there are also some great products out there). Many of them use ‘old’ ingredients which is fine and they give you great pumps. But your pumps have been great in the gym for a while now. You want phenomenal pumps. You deserve bigger pumps every day. NOS BOMB is the answer.